Samba Balloon is a new type of amusement equipment. It undulates between 1m and 1.5m. Samba Balloon is a large-scale recreation and entertainment project. It is similar to the spacecraft amusement project in some parks. There are 8 big balloons on the rotator and 8 cabins at the bottom, each cabin can take 2-4 people. When it runs, it moves up and down, like a samba dance, so it’s called a samba balloon. 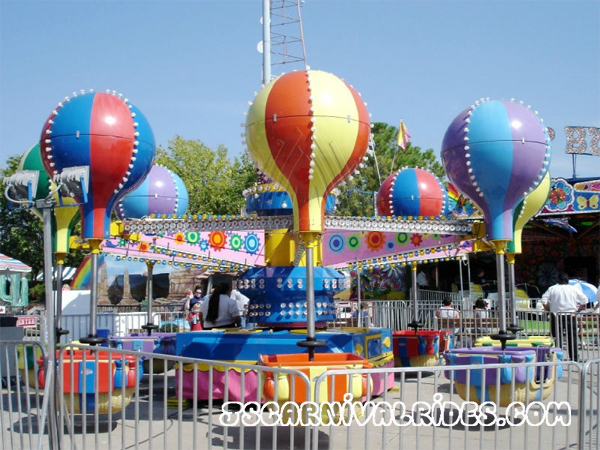 Samba Balloon is a perfect family amusement ride, which breaks the single riding mode of general rotating amusement equipment. This not only meets the needs of children, but also provides a convenience for a family to play together. In addition to the lifting, revolution, and autobiography, the samba balloon can be controlled by the passengers themselves. The balloon can rotate up and down, like samba dancing, passengers can have more fun! When night falls and all the beautiful lights are turned on, the rides will be more beautiful and spectacular! Next： What Points Should Be Noted in The Operation of Children’s Amusement Equipments?